"They came. They Shopped. They saved the world!" 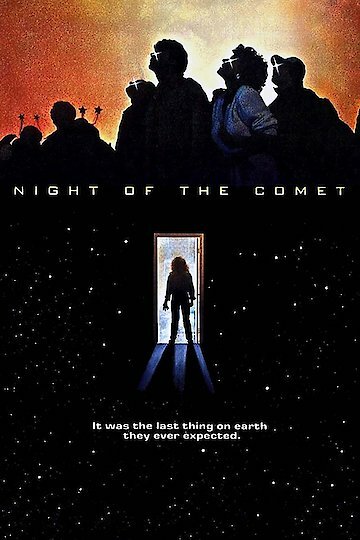 Night of the Comet is a science fiction film that made its debut on the big screen in 1984. The stars of the film included Catherine Mary Stewart, Kelli Moroney, Robert Beltran, Geoffrey Lewis. The plot of the movie revolves around two California girls who discover that they might be the last people on Earth. Regina is the name of the character played by Catherine Mary Stewart. Samantha is the name of the character that is played by Kelli Moroney. They are two Valley Girls who soon discover that all life on Earth is gone after emerging from a steel room in which they spent an all nighter. Soon, the girls learn that a comet has totally destroyed just about all the life on the planet. Actually, they are not alone. There are leagues of zombies roaming the streets. Therefore, the streets are not safe for them. Night of the Comet is currently available to watch and stream, buy on demand at Amazon online.